パム は ペリカンタウンの川の西側のトレーラーで暮らしている住人 です。 彼女はペリカンタウンバスが故障してしまうまでは、運転手をしていました。 Once bus service has been restored Pam will manage the バス停 just east of 牧場 on days where there is no rain. When the bus service has not been fixed by completing the Vault Room Bundles, most days Pam can be found in her trailer until 12:00 PM. She'll then walk over to Jojaマート for a few hours, leaving there at 4:00 PM to walk to スタードロップサルーン. Pam is one of ガス's most loyal customers. She spends every evening in his establishment. 8:00 AM Lounges on her couch in the trailer. 12:00 PM Leaves the trailer and heads to JojaMart. 4:00 PM Leaves JojaMart and heads to the saloon. 12:00 AM Leaves the the saloon and heads home. 8:30 AM Leaves the trailer to head to the bus stop just east of the farm. 10:00 AM Arrives at the bus stop for the afternoon. 5:00 PM Leaves the bus stop and heads to the saloon. 12:00 AM Leaves the the saloon and back home for the night. 11:30 PM Leaves her trailer and heads to the medical clinic for her annual checkup. 1:30 PM Continues her checkup at the clinic. 4:00 PM Leaves the clinic and heads to the saloon. 12:00 AM Leaves the the saloon and heads home for the night. Purchase the "Community Upgrade" from the Carpenter's Shop. After earning 9 hearts of friendship with Pam, enter Pam's house at least 4 days after the Community Upgrade is completed. 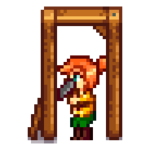 You find Pam praying before a Sign of the Vessel statue. She confesses that she loves the new house, but hasn't been able to cut back on her drinking. She says she thought the new house would change everything, but it didn't, so she ordered the statue. She then turns to the player for a response. Pam says she's "getting sappy" in her old age, and the cutscene ends. Pam becomes angry and declares her faith in Yoba before ordering you to leave. "Pam is Thirsty": Pam will send you a letter on the 14th of Summer requesting a Pale Ale. The reward is 350g and 1 Friendship heart. "Pam Needs Juice": Pam will send you a letter on the 19th of Fall, year 2, requesting a Battery Pack. The reward is 400g and 1 Friendship heart. Pam may randomly request an item at the "Help Wanted" board outside Pierre's General Store. The reward is 3x the item's base value and 150 Friendship points. In v1.3, Pam no longer follows you into the bus when purchasing a ticket to the desert. Instead, she stands in place until the bus cutscene triggers. This may have been done to prevent the rare "disappearing Pam" bug, in which Pan would disappear from the game and never return. 1.3: ハート9のイベントが追加されました。Changed bus stop animation.